A bar (also known as a slab, block, candybar) phone takes the shape of a cuboid, usually with rounded corners and/or edges. The name is derived from the rough resemblance to a chocolate bar in size and shape. This form factor is widely used by a variety of manufacturers, such as Nokia and Sony Ericsson. Bar-type smartphones commonly have the screen and keypad on a single face. Sony had a well-known 'Mars Bar' phone model CM-H333 in 1993. These are variants of bars that have a full QWERTY keyboard on the front. While they are technically the same as a regular bar phone, the keyboard and all the buttons make them look significantly different. Devices like these were popular in the mid- to late-2000s but lost popularity afterwards. The BlackBerry line from Research In Motion (RIM) was particularly popular and influential in this category. "Brick" is a slang term almost always used to refer to large, outdated rectangular phones, typically early devices with large batteries and electronics. Such early phones, such as the Motorola DynaTAC, have been displaced by newer smaller models which offer greater portability thanks to smaller antennas and slimmer battery packs. However, "brick" has more recently been applied to older phone models in general, including non-bar form factors (flip, slider, swivel, etc. ), and even early touchscreen phones as well, due to their size and relative lack of functionality compared to current models on the market. The term "brick" has also expanded beyond smartphones to include most non-working consumer electronics, including a game console, router, or other device, that, due to a serious misconfiguration, corrupted firmware, or a hardware problem, can no longer function, hence, is as technologically useful as a brick. The term derives from the vaguely cuboid shape of many electronic devices (and their detachable power supplies) and the suggestion that the device can function only as a lifeless, square object, paperweight or doorstop. This term is commonly used as a verb. For example, "I bricked my MP3 player when I tried to modify its firmware." It can also be used as a noun, for example, "If it's corrupted and you apply using fastboot, your device is a brick." In the common usage of the term, "bricking" suggests that the damage is so serious as to have rendered the device permanently unusable. A slate or slade (UK English) is a smartphone form with few to no physical buttons, instead relying upon a touchscreen and an onscreen keyboard. The first commercially available touchscreen phone was a brick phone, the IBM Simon Personal Communicator, released in 1994. The iPhone, which was released in 2007, is largely responsible for the influence and achievement of this design as it is currently conceived. Some unusual "slate" designs include that of LG New Chocolate (BL40), or the Samsung Galaxy Round, which is curved. HTC Magician, a pre-contemporary slate from 2004. LG Prada, a slate phone from 2006. An iPhone 4S, a slate phone from 2011. The phablet or smartlet is a subset of the slate/touchscreen. A portmanteau of the words phone and tablet, phablets are a class of mobile device designed to combine or straddle the size of a slate smartphone together with a tablet. Phablets typically have screens that measure (diagonally) between 5.3 and 6.7 inches, and are considerably larger than most high-end slate smartphones of the time (i.e. the Samsung Galaxy Note II smartlet versus the Samsung Galaxy SIII smartphone), which have to be 5.2 inches or less to be known as a smartphone, though significantly smaller than tablets (which must be 7 inches or above to be considered as such). The multi-screen is of basically the slate form factor, but with two touchscreens. Some have a small separate screen above the main screens, the LG V10 and LG V20. Other multi-screen form factors has screens on both sides of the phone. In the case of Yotaphone and Siam 7X, they have normal touchscreens on the front, but on the backside is an e-ink screen, which enables using the cases in a fashion similar to reading a book. The presence of the front camera for taking selfies has been an essential feature in smartphones, however, it is a difficulty to achieve a bezelless screen as is the trend in the later 2010s. The Nubia X and Vivo NEX Dual Display have solved this combining the use of the main camera and a smaller second rear screen, eliminating the front camera. 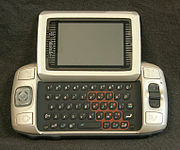 The taco form factor was popularized by the Nokia N-Gage, released in 2003. It was widely known as the plastic taco for its taco-shape and the placement of microphones on the side of the device, which, when one talks into the microphone, gives the appearance of eating a taco. Other models include Nokia 3300 and Nokia 5510. A smartphone in the form of a wristwatch is typically referred to as a watch phone. A flip or clamshell phone consists of two or more sections that are connected by hinges, allowing the phone to flip open then fold closed in order to become more compact. When flipped open, the phone's screen and keyboard are available. When flipped shut, the phone becomes much smaller and more portable than when it is opened for use. Motorola was once owner of a trademark for the term flip phone, but the term flip phone has become genericized and used more frequently than clamshell in colloquial speech. Motorola was the manufacturer of the famed StarTAC flip phone in the 1990s, as well as the RAZR in the mid-2000s. There were also flip "down" phones, like the Motorola MicroTAC series and was also widely used by Ericsson. In 2010, Motorola introduced a different kind of flip phone with its Backflip smartphone. When closed, one side is the screen and the other is a physical QWERTY keyboard. The hinge is on a long edge of the phone instead of a short edge, and when flipped out the screen is above the keyboard. Another unusual flip form was seen on the luxury Serene, a partnership between Samsung and Bang & Olufsen. Clamshell came to be used as generic for this form factor. Flip phone referred to phones that opened on the vertical axis. As clamshells disappeared from the market, the terms again became disambiguated. 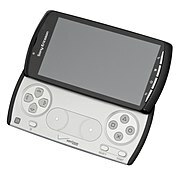 By the mid-2000s, "flip" designs reached the peak of their availability and declined afterwards, being replaced by sliders which in turn were completely replaced by slate smartphones. In April 2011, Kyocera International released the Kyocera Echo smartphone that have a foldable form factor and dual touchscreen on both sides. In November 2017, ZTE announced the Axon M which have dual touchscreen that can fold up. The combined display size is 6.75-inch when unfolded. The second screen also works as a kickstand. Due to advances in display technology, as of 2010s, OLED screens can be manufactured on a flexible, plastic substrate. Glass is no longer needed, allowing the displays to be rolled, bent and folded. This makes new form factors possible in mobile phones. In September 2017, Samsung confirmed a new series of foldable smartphone. In November 2018, it is revealed that the new phone—Samsung Galaxy Fold's combined display size is 7.4-inch. Other manufacturers, such as Huawei and Xiaomi have also announced phones with foldable displays. A slider is composed of usually two, but sometimes more, sections that slide past each other on rails. Most slider phones have a display segment which houses the device's screen, while another segment contains the keypad or keyboard and slides out for use. The goal of a sliding form factor is to allow the operator to take advantage of full physical keyboards or keypads, without sacrificing portability, by retracting them into the phone when they are not in use. Many different companies have developed smartphones that slide: Samsung has the Corby and BlackBerry has the Torch. 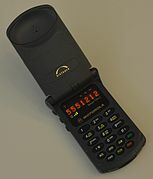 The Siemens SL10 was one of the first slider smartphones in 1999. Some phones have an automatic slider built in that deploys the keypad. Many phones pop out their keypad segments as soon as the user begins to slide the phone apart. Unique models are the 2-way slider where sliding up or down provides distinct functions: the Nokia N85 or Nokia N95 are examples of this. A version of the slider form factor, the side slider or QWERTY slider, uses vertical access of the keyboard on the bottom segment. The side slider form factor is primarily used to facilitate faster access to the keyboard with both thumbs. The Motorola Photon Q, Danger Hiptop, Sony Mylo, and HTC Touch Pro are four primary examples. 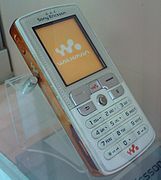 Some unusual sliders have also been made, such as the Nokia 7280 modelled like a lipstick, or the Samsung SGH-F520 from 2007 which slides two ways with a QWERTY keyboard. Sliders supplanted the flip form, since they allowed manufacturers to pack more keypad buttons and features (especially the side slider or QWERTY slider) into the same form factor, while touchscreen interfaces were still in their infancy. By the late-2000s, "slider" designs reached the peak of their popularity and declined afterwards, being completely replaced by slate form factors with well-developed touch interfaces. In 2015, BlackBerry Limited (previously RIM) released the BlackBerry Priv, the first mainstream slider phone in several years (based on Android, not the Blackberry operating system they sold so far). As 2018, manufacturers are trying to develop bezelless smartphones, being the greatest difficulty the presence of front cameras and face recognition sensors, while most brands expand display real state conserving a notch, some departs from that approach returning to the slider form factor, in models like Xiaomi Mi Mix 3, Huawei Honor Magic 2 and Lenovo Z5 Pro. Phones like Oppo Find X and Vivo Nex hide front cameras within the body of the devices in motorized pop-up modules to create a bezelless front face fully occupied by screens without any cutout while keeping a front-facing camera that can up when required. Vivo V15 Pro  and Centric S1  also come with pop up camera mechansim for selfie camera. A swivel phone is composed of multiple, usually two, segments, which swivel past each other about a central axis. Use of the swiveling form factor has similar goals to that of the slider, but this form factor is less widely used. Samples are Amoi 2560, Danger Hiptop, LG U900 + 960 + V9000, Motorola Flipout + V70 + V80, Nokia 7370, Philips 968, Siemens SK65, Samsung Juke + Samsung SGH-X830, Sharp SX862 and Sony Ericsson S700i + W600. Some mobile phones use more than one form, such as the Nokia N90, Samsung SGH-P910 or Panasonic FOMA P900iV, which use both a swivel and a flip axis. 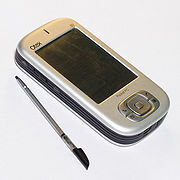 Other examples include the Sierra Wireless Voq which combines a candybar with a keyboard "side-flip"; the Nokia Communicator series which utilise both a candybar and a clamshell with a QWERTY keyboard; or the Siemens SK65 which is a swivel candybar with a QWERTY keyboard. ^ "Samsung showcases T509 Slim Bar Phone". 6 April 2006. Retrieved 18 May 2008. ^ Associated Press (11 April 2005). "First cell phone a true 'brick'". MSNBC. Retrieved 18 May 2008. ^ Olson, Darrin (19 February 2007). "80's Brick Cell Phone". SlipperyBrick.com. Pragmatic Labs. Retrieved 18 May 2008. ^ "DynaTAC 8000X - the World's First Mobile Phone". h2g2. BBC. 3 July 2003. Retrieved 18 May 2008. ^ "The Big Android Dictionary: A Glossary of Terms You Should Know". WonderHowTo. Retrieved 6 May 2017. ^ "Multi-Touch Systems that I Have Known and Loved". 2 March 2012. Retrieved 31 August 2012. ^ "The dual-screen Nubia X solves the notch problem with extreme over-engineering". The Verge. Retrieved 1 November 2018. ^ "Vivo NEX Dual Display edition review: Dual displays done right". ^ Microsoft Mobile Oy. "Microsoft". Retrieved 23 March 2016. ^ Kyocera Echo review. Engadget.com. Retrieved on 2013-12-09. ^ "Watch how ZTE Axon M's dual screen transforms your daily smartphone habits". techradar.com. 20 November 2017. ^ "ZTE Axon M review: double trouble". The Verge. 17 November 2017. ^ Ali, Zara (17 October 2017). "ZTE Launches 'Axon M' The First Dual-Screen Foldable Smartphone". ^ "Samsung accidentally revealed it's making a new FOLDABLE smartphone called Galaxy X". The Sun (United Kingdom). 21 November 2017. ^ "Xiaomi teases a double folding phone". Foldable News. 23 January 2019. ^ "Huawei will unveil a foldable device in Barcelona". Foldable News. 24 January 2019. ^ "4b Sliding Qwerty keyboards". Retrieved 15 October 2013. ^ Ruddock, David (5 November 2015). "BlackBerry Priv Review: Good, But Probably Only For Keyboard Junkies". Android Police. Retrieved 23 November 2015. ^ "The Slider Phone Is Back to Kill the Notch". Tom's Guide. Retrieved 25 October 2018. ^ Petrov, Daniel. "Xiaomi Mi Mix 3 is official, a 93% screen slider with up to 10GB RAM and a 5G version". Phone Arena. Retrieved 25 October 2018. ^ "Honor Magic 2 slider arrives with six cameras and UD fingerprint scanner". GSMArena.com. Retrieved 31 October 2018. ^ Sin, Ben. "Honor Magic 2 Hands-On: Slider Phone With Six Cameras". Forbes. Retrieved 31 October 2018. ^ "Lenovo finally delivers an "all screen" phone with the Z5 Pro". xda-developers. 1 November 2018. Retrieved 1 November 2018. ^ "Review: Hands-on with the Oppo Find X". Newshub. 6 October 2018. Retrieved 25 October 2018. ^ "The pop-up selfie camera on this phone is pure magic". CNET. 25 July 2018. Retrieved 18 September 2018. ^ "Vivo V15 Pro Specifications and Price". Techlomedia gadgets. 26 February 2019. Retrieved 26 February 2019. ^ "Centric S1 with 6.2-inch Full HD AMOLED display, Helio P70, pop-up selfie camera launched at MWC 2019". Techlomedia. 26 February 2019. Retrieved 26 February 2019. This page was last edited on 19 April 2019, at 08:47 (UTC).